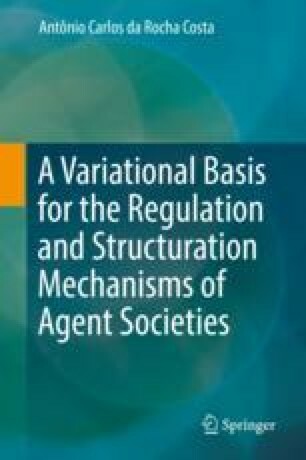 Agent societies (Costa and Dimuro, A minimal dynamical organization model. In Dignum (ed) Handbook of Multi-Agent Systems: Semantics and Dynamics of Organizational Models. IGI Global, Hershey, pp 419–445, 2009; Costa, On the bases of an architectural style for agent societies: Concept and core operatory structure. Open publication on www.ResearchGate.net, https://doi.org/10.13140/2.1.4583.8720, 2014) are formal models of social systems. They may serve as semantical domains for formal approaches to social theory (e.g., Costa, Artif Intell Law 43:43–102, 2015; Costa, Axiomathes 27:15–78, 2015) as well as specification models for the computational implementation of multiagent systems that realize full-fledged social systems (see, e.g., Wooldridge, Introduction to multiagent systems, 2nd edn. Wiley, London, 2011 for an introduction to multiagent systems).